As part of a reissue series for ZTT Records a special 2 CD package titled The Art Of The 12” emerged which featured the extended version of ‘Julia’s Song’. 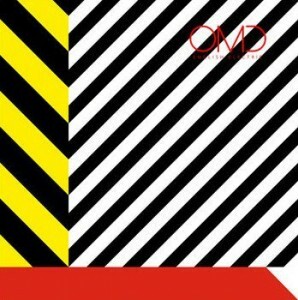 This marked the first time that OMD’s re-recorded version of the OMITD classic had been issued on CD. The extended version was first available as the B-Side to the 12” release of ‘Talking Loud & Clear’ in 1984. 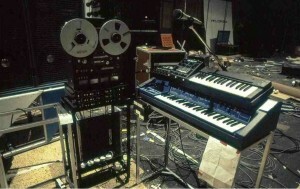 Our sister site The Electricity Club did a special feature on OMD’s choice of equipment, particularly for the live setup on the 1983 Dazzle Ships tour. “Some of the more purist observers complain about the lack of analogue instruments in the current live shows” Andy McCluskey said recently: “Who says that digital can’t be a beautiful as analogue?”. OMD flew to Manila in March to perform live for a gig which Andy McCluskey described as “Good but weird. It was like playing in the old days when the audience knew some songs but not all”. 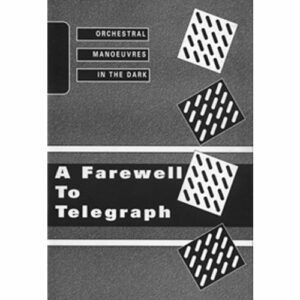 While the audience reaction to most of the classic OMD songs was good, songs such as ‘Maid Of Orleans’ and S’ailing On The Seven Seas’ was “tumbleweed time”. 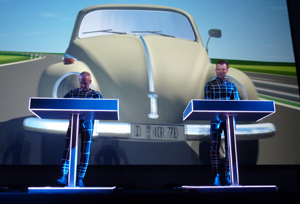 April saw Kraftwerk performing live in New York – and Messages correspondent Lori Tarchala was there to capture the details: “Being the night of Radio-Activity, this meant that we’d hear that particular LP in it’s entirety so after the bonus of ‘Robots’, they launched into the title track. Track by track the band went through the album, each song being accompanied by various graphics, most of them in 3-D format. There was an old fashioned transistor radio that had a hand that came out to turn the dial while a red elongated bar moved back and forth, Antenna had sound wave looking beams that radiated out and were cut in two by vibrating blazing bars that wiggled across the screen and the added bonus of stereo sound found me looking from one side of the upper corner of the room to the other, at times expecting to see something coming down on us”. 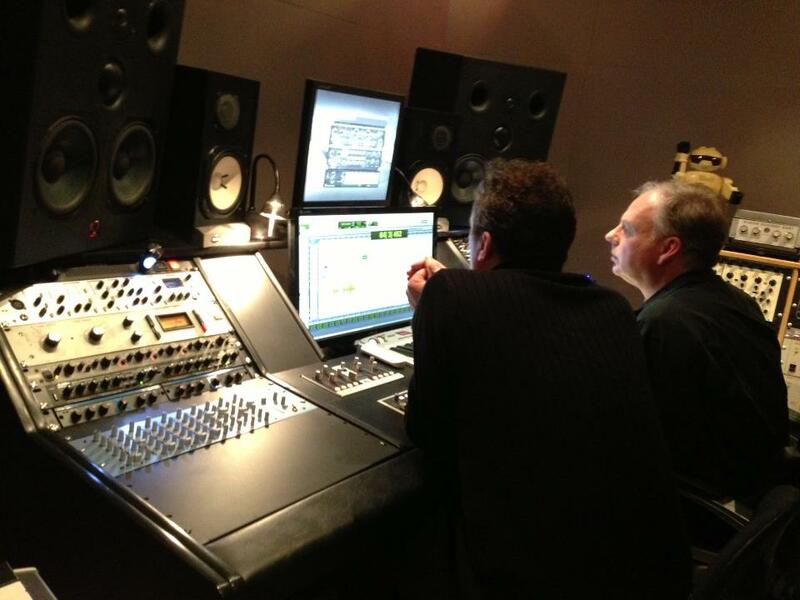 April also provided OMD fans with an update on the progress on English Electric. Andy McCluskey provided a brief essay on the OMD Website on the emerging album: “Lyrically, EE seems to be an exploration of how one’s Utopian dreams often end in dystopic failure and regret. Musically, it uses many current sounds and styles. ‘Dresden’ sounds very ‘OMD,’ ‘Our System’ is like a Glitch style Stanlow/ROTT if that can be imagined. 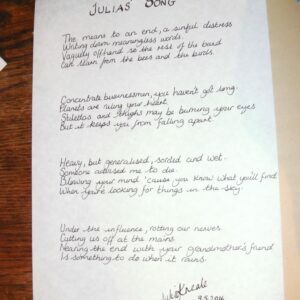 ‘Helen of Troy’ sound like ‘Georgia’ meets first album Depeche. ‘Please Remain Seated’, ‘Decimal’, and ‘Atomic Ranch’ use programmed robotic voices and have a hint of Dazzle Ships to them”. In May, Messages decided to experiment with the Spotify streaming service. With Spotify allowing a new embeddable option, we decided this was a good opportunity to place music directly on the Messages site. June saw the arrival of a new OMD music piece, except that this was for a Canadian art exhibition by Katie Bethune-Leamen centered on arctic explorer Robert Peary. Keeping up the art-related music ventures, Paul Humphreys was teamed up with writer Douglas Coupland by Alcatel-Lucent for a special project. 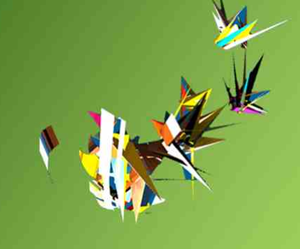 The concept was an audio visual interpretation of network usage which resulted in an installation titled Electric Ikebana. Meanwhile, Andy McCluskey took part in an event for the Wirral Festival Of Firsts with a talk hosted by Festival Director John Gorman (The Scaffold). The Festival also saw the premiere of a play titled Enola Gay which featured a split stage presentation showing the flight deck of the Enola Gay alongside the room of a Japanese woman based in Hiroshima. Summer also saw Andy appointed as a Trustee of National Museums Liverpool. Paul Humphreys and Claudia Brucken were interviewed by The Electricity Club on their plans for OneTwo as well as taking time to discuss Claudia’s solo projects and Paul’s work on English Electric. Paul joined Claudia for a special performance at London’s Bush Hall on 19th July. The show, titled ‘This Time Too: It’s Claudia Brucken’, also had special guests including Andy McCluskey, Heaven 17’s Glenn Gregory and Martyn Ware, Susanne Freytag from Propaganda and Andrew Poppy. August saw Andy take part in a special round table panel at Abbey Road Studios discussing the history of electronic music. Other guests in the debate included Daniel Miller, Mark Jones (Wall Of Sound), Matthew Herbert (BBC Radiophonic Workshop) and Martyn Ware (Heaven 17). The panel was part of EMI’s Electrospective campaign. Olympic fever was also building in the UK and OMD were honoured to have ‘Enola Gay’ featured during the Opening Ceremony of the events (although sadly it wasn’t featured on the soundtrack album). OMD headlined at the Flashback Festival in Nottinghamshire on the 18th August. The band also performed at the Rewind Festival in Henley. Absolute Radio caught up with Andy and Paul backstage at the Rewind event for an interview. South Africa also saw the return of OMD with 2 shows in Johannesburg and a show in Cape Town during August. August continued to be a busy month for OMD live shows with the band performing in Antwerp for the Openluchttheatre concert. The band announced that following this busy period of live performances, they would be spending September and October finishing English Electric, stating that many of the tracks were now ready to mix with 3 needing vocals to be finally recorded. A later update in September clarified that the album was coming to the end of recording with most of the songs now complete (the vocals on ‘Our System’ being one of the final tasks), adding that 2 possible late additions might be included. October was set aside for mixing the album. In October, Andy took time out to record an appearance on Janice Long’s Review Show for Vintage TV. The show also featured Martin Fry and Paul Morley discussing albums such as Hounds of Love by Kate Bush, Lexicon of Love by ABC, Different Class by Pulp and Please by Pet Shop Boys. The OMD website also announced that filming behind the scenes of the recording of English Electric had also been underway. The footage featured discussion of the tracks included on the album, Andy singing some of the songs and a general insight into the recording of the new album. The footage is scheduled for release as a bonus DVD on deluxe versions of English Electric. December saw OMD finally announce details of the planned English Electric live shows for 2013. 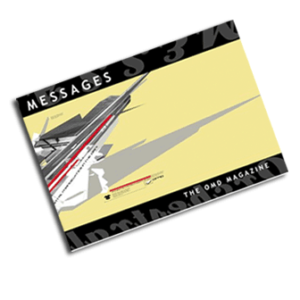 An unfinished version of the sleeve artwork was also leaked and was discussed in detail here on the Messages site. With 2012 coming to a close, all anticipation is now focused on 2013 with the release of English Electric and the continuing story of OMD. 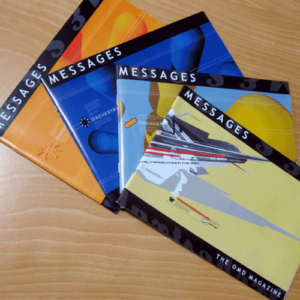 Thank you to everyone who has supported the Messages site during 2012, particular thanks to Lori Tarchala. Special thanks to Andy McCluskey and the OMD team.